A key element of the Superman mythos has always been the perpetually unresolved love triangle between Clark Kent, Lois Lane, and Superman. Throughout most of the chronicles, followers of Superman's adventures in the comic books had seen stories in which Superman and Lois Lane were married, but these episodes were always "imaginary stories," or "Mr. and Mrs. Superman" tales from Earth-2. Television viewers had once seen the marriage, but it was presented as a make-believe dream that Lois Lane had in an episode of Adventures of Superman. But beginning in the 1970s, Superman scribe Elliot S! Maggin, throughout his tenure as writer, introduced two changes to this concept: He showed the couple falling in love as Clark and Lois rather than as Superman and Lois. He also wanted them to get married for real - and to stay married. The editorial direction on the comic books prevented such a romance from ever progressing. But new DC President Jenette Kahn expanded the concept into a "new kind of Superman program," a live-action television series that would focus not on Superman, but on the romantic relationship between Clark Kent and Lois Lane. The purpose of the show would be to build towards their marriage. Her original title of the series was to be Lois Lane's Daily Planet. For years, she tried to sell it. But it wasn't until 1991, mainly due to the efforts of Les Moonves, then creative head of Lorimar Television, and writer-producer Deborah Joy LeVine, that the concept was sold to the ABC network. Gerard Christopher turned in an impressive performance for the initial casting and was the producers' first choice to play the dual role of Clark Kent and Superman. But once they discovered that he had already worn the cape in The Adventures of Superboy, they went with their next choice - Dean Cain. Dean was a Princeton graduate who had been headed for a career in pro football before an injury sidelined him. He was interested in writing and turned to acting only to gain access to Hollywood, but his rugged good looks and earnest demeanor were just what the show would need and later earned him plenty of fans. Teri Hatcher was cast as Lois Lane, Lane Smith as Daily Planet chief editor Perry White, and Michael Landis as Jimmy Olsen. The series, in a tip-of-the-hat to the original Adventures of Superman, was now renamed Lois and Clark: The New Adventures of Superman and didn't air until September of 1993. It was a phenominal success. With the first episode, it became clear that this was a much more lavish version of a Superman television series than had ever been seen. Lois & Clark focused on the Man of Steel's early adult years in Metropolis. There, disguised as reporter Clark Kent, he finds work at the Daily Planet newspaper. It is also there that he meets fellow reporter Lois Lane, who is infatuated with Superman and initially rebukes all of Clark's romantic overtures. In addition to the Planet staff, other major characters in the series included archvillain Lex Luthor and Superman's adoptive parents, Martha and Jonathan Kent. In a salute to the original Superman series, Phyllis Coates guest starred as Lois' mother, Ellen Lane. Coates had, of course, been one of the women to play Lois in the first Superman television series. Early on, Justin Whalen replaced Landis as cub reporter Jimmy Olsen, and the on-screen chemistry between the cast members seemingly clicked into place. A later episode guest-starred Jack Larson, who had played Jimmy Olsen in the Adventures of Superman, as an aged Jimmy Olsen. True to the original plan, Lois & Clark: The New Adventures of Superman played up the romantic aspects of the series as the season progressed. By the end of the second season Lois had finally realized that Clark Kent and Superman were the same person so it came as no surprise to her when he finally revealed his true identity and proposed marriage. Lois & Clark: The New Adventures of Superman was renewed for a third and fourth season. The much-planned wedding didn't take place until 1996, and due to communication mix-ups, lack of planning, and scheduling difficulties between the producers and the folks at DC, the dream that had been decades in the making was now presented to the world in a single, rushed-together issue of the comic book. 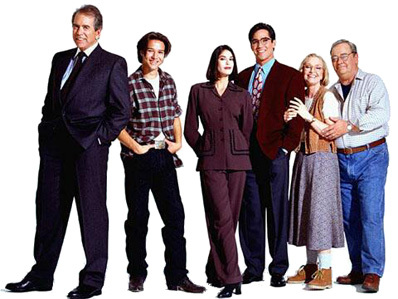 ABC cancelled the contract for the fifth season and the series went off the air in 1997.